Situated beside a bustling fishing port and harbour at Greencastle, Inishowen, is the Inishowen Maritime Museum and Planetarium, pictured above. 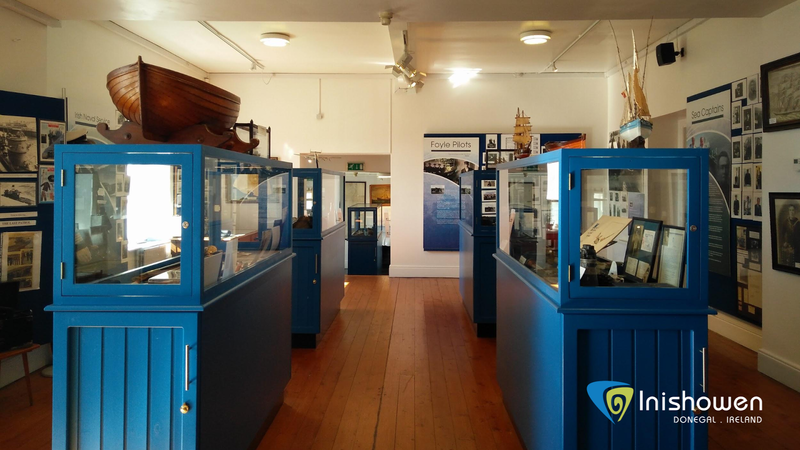 Housed in an impressive building, originally the Old Coast Guard Station, are artefacts that tell you the story of Inishowens rich Maritime Heritage. On arrival you will be greeted by the museums helpful and friendly staff, who will provide you with all the direction and information you need for your visit. Entering the main exhibition hall you will be greeted by an eye catching replica of a Basking Shark, pictured above, the largest fish species in the North Atlantic and second largest in the world. These gentle giants have been spotted off the coast of Inishowen by locals and visitors. Progressing through the hall you will encounter an impressive collection of boats and other maritime related artefacts, pictured below. Information panels provide the story and context behind the diverse range of objects on display. As you make your way through the exhibition space located on the 1st and 2nd floor you will notice there is a story and artefact to engage with at every corner. Visual aids will bring you back in time, as you learn about the impact of emigration in the area. Letters and personal objects on display are donated from families in the area. Located on the second floor, pictured above, is a wealth of objects and memorabilia telling the story of events that shaped the lives of those living in Inishowen and neighbouring Derry/Londonderry. 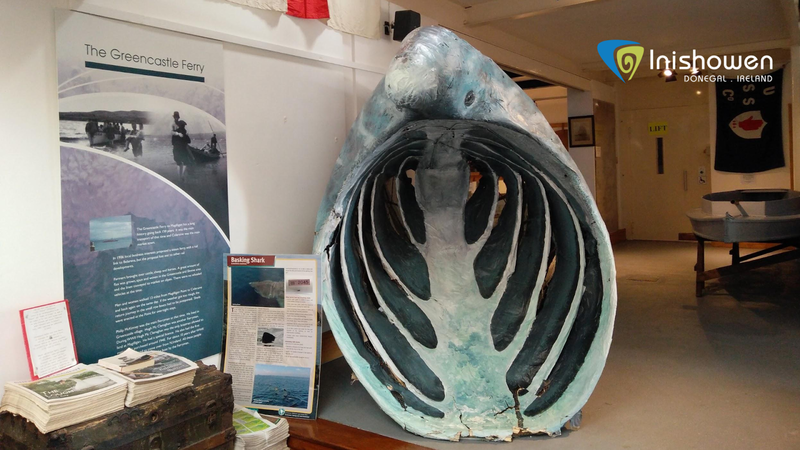 You will learn about how fishing and seafaring played an important role in the survival of families in Inishowen over the centuries and the role of local people who served in the Royal Navy and Irish Naval service during WW2. The rugged coastline of Inishowen has witnessed a number of shipwrecks over the centuries which include the La Trinada Valancera, an important vessel associated with the Spanish Armada Fleet that sank off the coast of Inishowen in 1588. 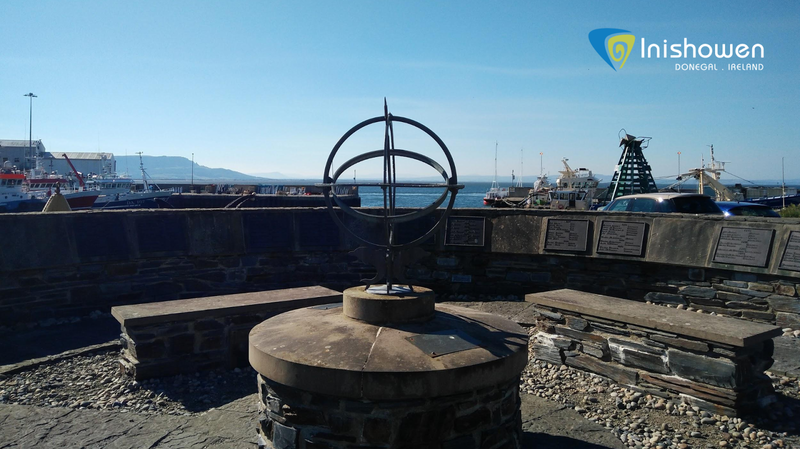 The story of the devastating and sometimes ruthless power of the sea is echoed by the Inishowen Maritime Memorial located at the front entrance to the museum. 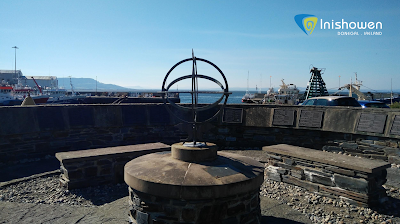 The Memorial pictured above, commemorates all those from the Inishowen Peninsula that lost their lives at sea. Maritime Heritage is one dimension of your museum experience as you will have access to an impressive full dome planetarium. On request you can experience one of the museums wonderful shows that caters to all age groups. Learn about Prehistoric Sea Monsters that once roamed our oceans, witness the wonders of our solar system and experience the award winning show "Dynamic Earth", that will bring you face to face with the wonders of our planet. The Planetarium, which includes comfortable seating, is a popular venue with visitors, school trips and families. The space is also used to host talks related to astronomy by astronomer Ash Mc Fadden. 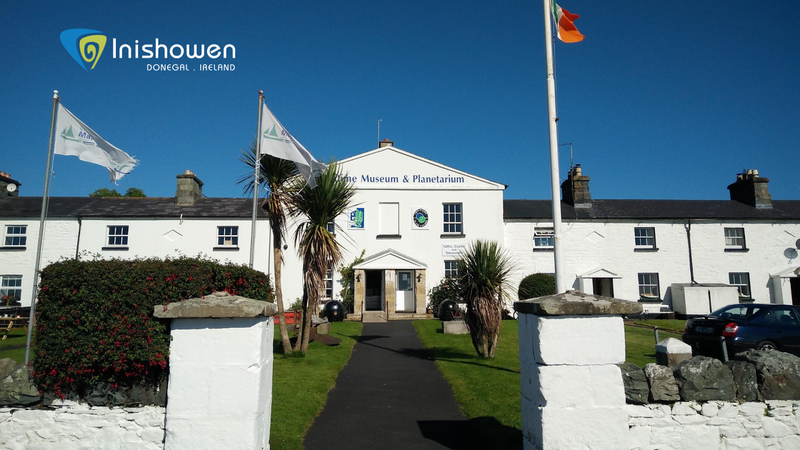 Greencastle Maritime Museum and Planetarium is open all year round so you will have ample opportunity to come and learn about Inishowens Maritime Heritage and the wonders of our planet and solar system.